During this week of 1783, winter was descending over the Eastern Seaboard of the young United States—and what the inhabitants couldn’t know was that it wouldn’t let up for months, and would nearly destroy the Union they had fought for in the years just before. On December 13th, my heroine Lark would have been bundled up in a carriage belonging to her neighbors, en route to Annapolis from Williamsburg. Her toes would be pressed against a once-hot brick, blankets and furs wrapped around her and the family she rode with in an attempt to keep the mounting cold at bay. When they trundled into Annapolis, the city was experiencing a sense of expectation—General Washington was coming, had sent word that he was only a few days away. His favorite room at Mann’s Tavern was no doubt being cleaned and aired. Visitors were arriving from all the states, men and women of respected worth who had been invited to witness a most historic event. For on the 23rd, two days before Christmas, the beloved general was resigning his commission and retiring to private life. 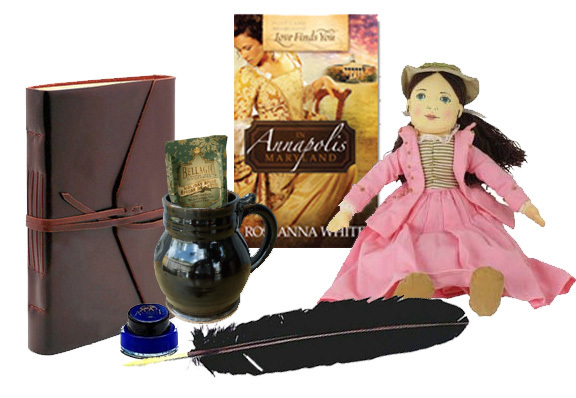 Lark arrived in Annapolis on December 17th, a mere two days before the esteemed Virginian she had met as a child. She scarcely had time to settle in with the family of her brother’s dear friend than she found herself stepping out to one of the most marvelous events of the winter—a ball in honor of Washington. This was a party whose extravagance was recorded with awe. Not surprising, really, since it was hosted by Charles Carroll, the wealthiest man in the nation. The state supplied 98 bottles of wine, plus 2 ½ gallons of liquor for the gentlemen. Nine pounds of sugar found its way into edibles for the guests. Eight pounds of candles were burned, and 12 packs of cards put into use. And what I find most interesting is the ritual called an illumination. It’s pretty much what it sounds like—everyone in the city, both private and public buildings, set candles and lamps in their windows to honor Washington, lighting their city in a glow of gratitude and respect. On the 23rd, at the strike of noon, Washington took to the State House floor and resigned from the army. Reportedly, his stately hand shook. His voice trembled. And soon as he had handed the papers to the president of Congress, he all but flew from the State House, his aides in tow, and from the city. He was home at Mt. Vernon the very next day, ready to celebrate Christmas with his wife and step-children. And then the snows came. Deep, frequent, and biting. New England reported record low temperatures of minus thirty. The states had never seen so much snow and ice. New Years entered on the heels of a ferocious storm, and it seemed the previous one never melted before the next came upon them. It wouldn’t lessen. It wouldn’t end. And it nearly destroyed the entire nation. Peace was tenuous, you see. The Treaty of Paris had been drawn up but not yet ratified. Representatives from 9 of the 13 states had to sign the document and return it to Paris by March. It took two months to cross the Atlantic. And by mid-January, they still hadn’t achieved the necessary congressmen. No one wanted to brave the terrible weather. A few had fallen gravely ill. Peace, so hard-won, looked as though it may be blown away by the bitter winter wind. Benjamin Franklin was in France waiting to receive the Treaty, and he wrote home about the terrible winter in Europe as well. His theory—that it was tied to the eruption of Mt. Loki, which had sent toxic fogs over much of Northern Europe. A revolutionary idea at the time, but scientists are now certain Franklin was right. Back then, folks were just hopeful that Franklin could be devious. ;-) Those statesmen in Maryland were ready to get tricky. Could they ratify with seven states instead of nine? Send it on and rely on Franklin to wheel and deal with King George? Could Old Ben be relied on for that? Should he be? If he begged with the eloquence he was known for, would England grant an extension? At home in Williamsburg, my heroine Lark wouldn’t have wondered much about all of this. She would have been preparing for her wedding, burying herself in a novel, trying her hardest to ignore her obnoxious cousin. But because she was in Annapolis, the guest of a household who claimed a friendship with all the leading statesmen, she witnessed all this—the victory and the fear, the excitement and the dread—firsthand. Because she was in Annapolis, she suddenly saw things about her young nation that she had never paused to examine. The hatred that still plagued them when it came to the Tories. The growing disagreement on issues of slavery. The reticence of these great men to do what they granted was, in theory, right. Snowed in through much of the winter, Americans had plenty of time to think. About what they had become, and how they had gotten where they were. About how the ideals that had led to the Declaration could be turned into a workable form of government. About what may happen to them if they didn’t hold true to their beliefs. They were men. Women. Uncertain and easily discouraged. Their fighting spirits had grown lax through the two years since Yorktown, and had been covered in a layer of ice that winter. We look back these centuries later and think mostly of the bravery, the patriotism, the high ideals. But let’s never forget that our founding fathers and mothers were people just like us. And that winter, as the New Englanders gathered on Christmas for quiet reflection and the Mid-Atlantic folks celebrated in the extravagant style of Merry Old England, they, much like us, probably wondered what the future would bring. This year as we gather with our families in thankfulness for the coming of our Savior, as some of us likely experience an abundance of snow while others are in the warmer states, it’s my prayer that we pause to remember that Long Winter, and all it meant. Then, to them—and now, to those of us who enjoy the freedom so hard-won. 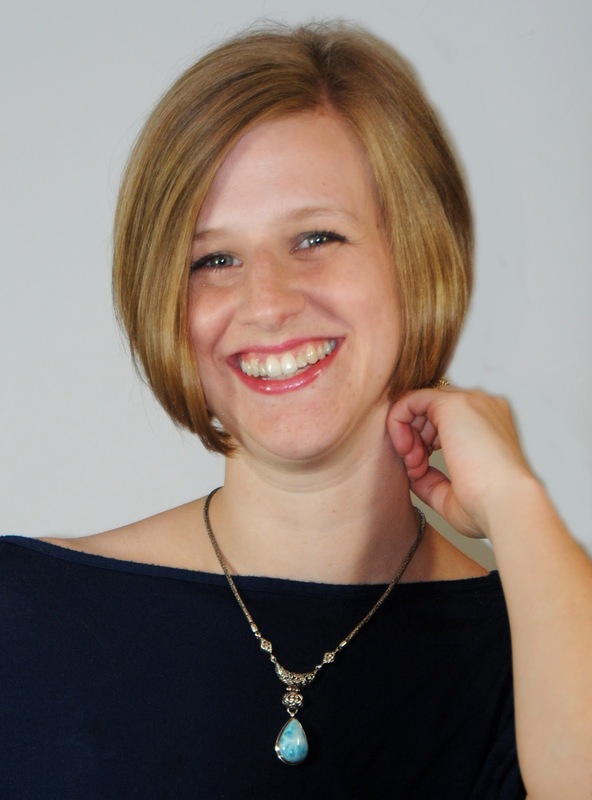 After graduating from St. John’s College in Annapolis, Maryland, she and her husband moved back to the Maryland side of the same mountains they equate with home. In 1784 peace has been declared, but war still rages in the heart of Lark Benton. Never did Lark think she’d want to escape Emerson Fielding, the man she’s loved all her life, but then he betrays her with her cousin. She flees to Annapolis, Maryland, the country’s capital, and throws herself into a new circle of friends who force her to examine all she believes. Emerson follows, determined to reclaim his bride. Surprised when she refuses to return with him, he realizes that in this new country he has come to call his own, duty is no longer enough. He must learn to open his heart and soul to something greater…before he loses all he should have been fighting to hold. Buy today at Amazon and other booksellers. Thank you for such a wonderful post Roseanna. I hobbled up all the history that your beautiful writing brought alive. Sadly the snow and cold too. Or is that because its only 22 outside? 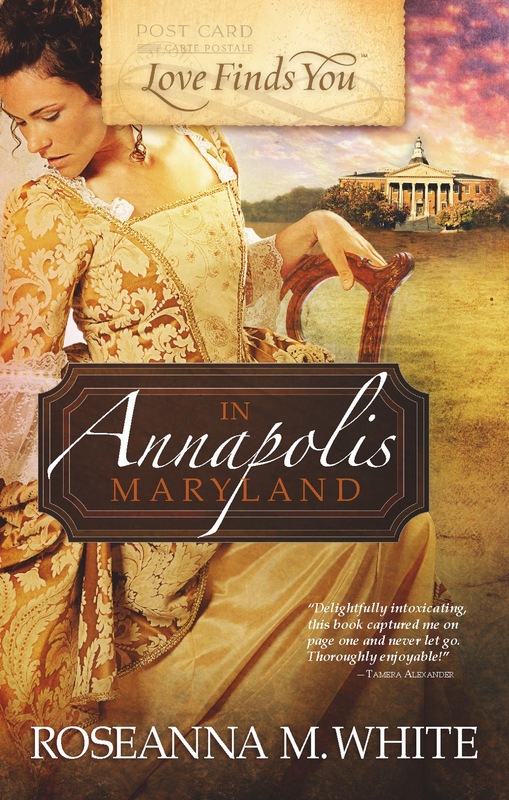 I look forward to this novel and a virtual visit back to that lovely Annapolis I visited. Thank you for guesting today. It's a treat to have you here. LOL, Debra! And thanks for the warm welcome--it's frigid here too, so that warmth is much-needed! Love the holiday look to the blog, Inkies! Like Deb, I hobbled - er, gobbled up every word and longed for more. If that's a preview of what is to come, I can't wait to read the book. Lisa designed our Christmas look. She's amazing, isn't she? Roseanna, I just ordered the book from B&N and can't wait to read it. The cover is amazing, and I think that gorgeous dress is very similar to the one on the cover of Washington's Lady. Beautiful. Sometimes I really wish we could all wear dresses like that. I know it would get tiresome with all those corsets and such, but in my dreams of gorgeous dresses, we all look good without the corsets - so we're not uncomfortable. I'm off to work. Have a fun day, ladies! I remember the day Roseanna emailed me and said, "Uh oh. Just found out they're in the middle of a giant snowstorm," or something like that. Lol. Anyway, the book is awesome and everyone should buy it. Beautiful post Roseanne—filled with history and emotion. It is humbling to look back at all or ancestors endured to bring this nation into being. And it is awesome to see God's divine help in our birth. Thanks for a lovely post! Loved the post, Roseanna! You have a gift I envy: You weave both setting and senses into the story with fluidity and strength. What a treat to read, in novels as well as blog posts! I love the cover, too. Gorgeous. Thanks, everyone! Yeah, Dina, I believe my email said something like, "Aggggghhh! It was SNOWY!" ;-) I didn't discover this info until over halfway through the book, so had it to go back and add it in. Glad you enjoyed the post, Elaine! I agree...a real treat to read! Thanks for hanging out with us today, Roseanna! I tried to get it at Lifeway this afternoon. But apparently they are already sold out. I think I know why! Can't wait to get my hot little hands on this one! I remember having a hot brick from the oven wrapped in newspaper and then a towel and tucked in at the foot of my bed to keep me warm during the night. I had forgotten that until I read your post today!